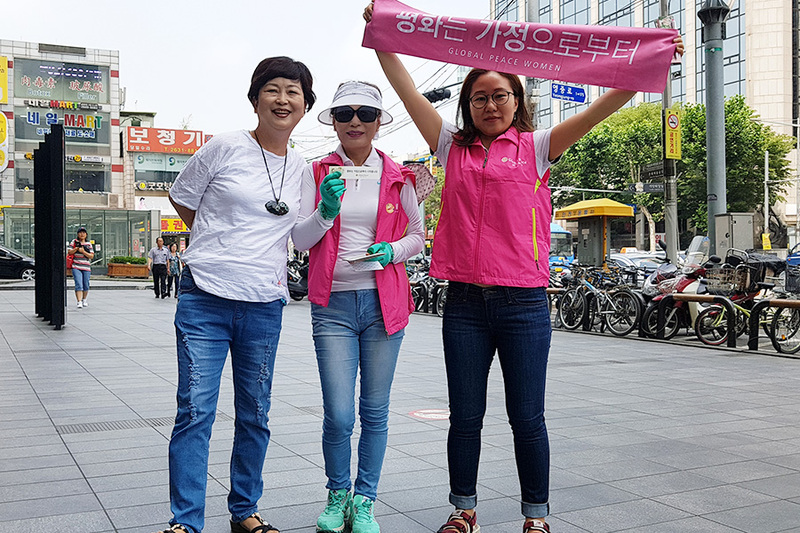 More than eight hundred Korean citizens participated in Global Peace Women (GPW) Korea’s most recent “Peace Begins in the Home” campaign to promote the significance and importance of Korea’s traditional family-values in building a thriving modern society. The one-day awareness project led by twenty GPW volunteers was conducted in Yeongdeungpo Station Square in Seoul, Korea on June 29. GPW projects and mentorship programs strengthen families as the foundation of healthy societies, recognizing the family institution as the key to addressing the most challenging social issues facing our world today. The Peace Begins in the Home campaign is an international project held in fourteen different countries to encourage women-led initiatives that support healthy families, communities and societies. The project’s “Sharing Photo Campaign” allowed Korean citizens to add their voice of support by uploading photos of themselves holding the “Peace Begins in the Home” banner. 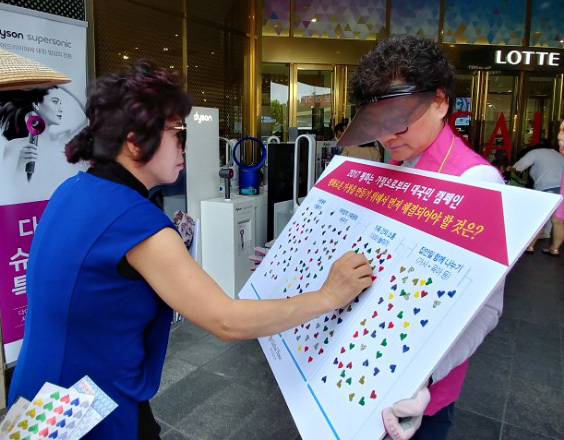 Campaign participants filled out surveys, posted pictures and learned more about the relevance of healthy families in efforts for Korean reunification. Yong Jae Kim, a Peace Begins in the Home campaign presenter and co-representative of Action for Korea United (AKU), emphasized the need for peace-related education at the dinner table in the home. As the example for peaceful cooperation, parents have an irreplaceable and essential responsibility to demonstrate attitudes, behaviors and strategies that promote collaboration, reconciliation and a way forward. GPW Korea has promoted the Peace Begins in the Home campaign in seven different cities across Korea and will continue to spread the campaign’s message with supplementary service projects and awareness programs.